I'll be keeping track of my October paranormal reads here. To see the original post (with rules, sign up - closes October 7th - and list of books you could win), click here. To submit your reviews, click here. My goal for October is to read 8 paranormal books - at least 3 ebooks (which I already have picked out) and 5 paper books. I'm a fairly slow reader and have a lot going on, so that's a bit ambitious for me, but I'm going to try my best! 8 books lol..maybe 4..maybe..I have to do 3 of course..I like to set my goals low and go ahead of them. Yeah I know....kinda cheating! 8 is very brave! I'm starting Uni again this week, so I'm going for the bare minimum of 3 I'm afraid, and any I manage on top of that is a bonus! 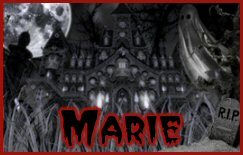 You can do it, Marie! I've got one already read, and still have two left. I'm not gonna be too ambitious, since I want to spend more time doing other things I've been neglecting lately. But, I'm so excited to get my reviews up and entered in your challenge! Wow! Looks like you're going to achieve all 8... I'm only on book number three and chuffed with my small achievement, lol.